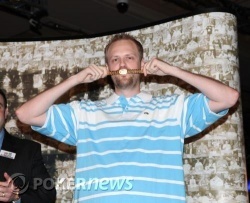 Congratulations to Travis Johnson - the World Series of Poker's newest bracelet winner! A huge field of 2,791 players entered this event and after three long days of play only one player is left standing. Travis Johnson was a prominent figure throughout play today as he got the better of some big pots early on against Gary Tang and Michael Pesek, and rode the wave all the way to the final table. He continued to apply pressure on his opponents, and his aggressive approach finally got him over the line against a valiant Steve Karp in a tough heads-up battle. Travis Johnson will take home an incredible $666,853 for his efforts, and of course, the coveted bracelet. Thanks for your company and join us again tomorrow for our continued coverage of the 40th annual World Series of Poker! Steve Karp limped in on the button and Travis Johnson open shoved. Karp made an instant call and we saw the hands. 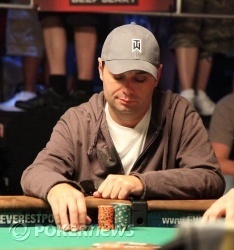 Karp held his lead on a flop of , but the on the turn snatched it away. 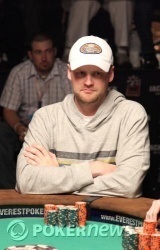 The on the river offered no help and Johnson took the pot, the $666,853 first-place prize, and the bracelet. Karp earned $414,116 for his play. Johnson again raised to 350,000 from the button and Karp fought back, reraising all in for 2.6 million. Johnson considered his options for about 30 seconds before mucking. Johnson continued to apply pressure, raising to 335,000 from the button. When Karp called, we saw a flop of . Both players checked and, with the on the turn, Karp led out for 340,000. Johnson called and Karp bet 500,000 more when the spiked on the river, forcing a fold from Johnson. Karp now has 2.6 million chips vs. Johnson's 9.9 million. As the night grinds on, Karp is beginning to look tired and frustrated while Johnson is anything but. He's smiling and having fun while pressuring Karp on almost every hand. With blinds going up next hand, here's a quick chip count. When Karp limped in from the button, Johnson checked his option and we saw a flop of . Johnson checked, Karp bet 150,000, and Johnson raised to 500,000. Karp called and the came . Johnson led for 1 million and Karp called again. With the on the river, Johnson shoved and Karp tanked before finally releasing his hand. When Johnson took the pot, Karp had just 2,650,000 left behind. Steve Karp and Travis Johnson seem to be feeling each other out in the starting stages of heads-up play. Neither man has been willing to put a lot of chips in the middle, and they're trading a lot of small pots. In one recent hand, Johnson raised to 275 from big blind and Karp called. The pair then checked down the board of . When the hands opened, Karp showed for a pair while Johnson showed .